The BP oil spill debacle moves forward. 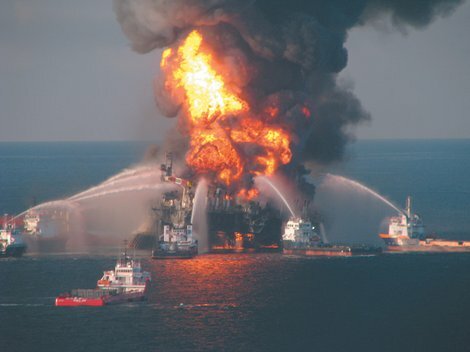 BP settled criminal charges for $4 billion. BP is following a smart strategy, if you ask me. They seem to want to settle, not end up in court. Exxon fought a huge number of cases over a decade or more after their Valdez Oil Tanker leaked oil over the pristine Alaska coasts. In pleading guilty, BP was admitting to 11 counts of manslaughter. Failing to shut down the runaway Macondo well in spite of key tests indicating it was in grave danger is quite a charge. Imagine the pressure from PB officials to open that well versus the undeniable pressure of the key tests showing imminent danger!! Two employees were indicted with manslaughter charges after 11 died on the Deepwater Horizon rig. Another BP employee was indicted for falsifying the spill numbers in an attempt to minimize BP’s liability. Donald Rainey, a former BP vice president in charge of exploration for the Gulf of Mexico faces charges of obstruction of justice for providing Congress with false spill rate numbers. The indictment charges that the two men, Robert Kaluza and Donald Vidrine, failed to recognize the key importance of a test showing pressure building up in the drill pipe. The criminal charges amount to the biggest criminal fine in US history. That’s saying a lot, but for BP, $4 billion is pocket change. They clear that much every month. A very important point to remember that while the criminal charges were settled, the civil charges remain. Those could amount to way more than $4 billion. The key civil figure is based on how much BP will be fined for all the oil they spilled. That’s a lot of oil, so I believe the $4 billion will be easily topped. There are some troubling details in the indictment. The document says in several places that Vidrine and Kaluza failed to alert onshore engineers about the high pressure the test found. But sealed court filings obtained by the Times-Picayune show otherwise. Vidrine called Mark Hafle, a BP engineer in Houston, 57 minutes before the rig exploded. The conversation between Vidrine and Hafle was recounted in a July 2010 interview with BP investigators. Apparently Hafle tried to convince Vidrine that the test might have been improperly run. That shows the unbelievable pressure on Hafle to tow the company line and get that rig online now, not later. This is a textbook example of how not to run your multi-billion dollar rig. Listen to your key people at the rig, and you will be much happier, and the environment will be happier, too. The malfunctioning blowout preventer is certainly plays a major role for the blowout. To work properly, the preventer must be perfectly centered in the pipe. That didn’t happen, so the preventer was unable to cut the pipeline. Inside the pipeline, a dozen or more spacers are needed to keep the pipeline where it belongs. Apparently, only a few spacers were actually used, meaning the pipeline had no chance of remaining perfectly centered. Whoever failed to properly center the pipeline by using too few spacers plays a major role in the Macondo blow up. So there is plenty of blame to go around, and blaming an executive and two rig workers is partially the wrong thing to do. The word ‘scapegoat’ comes to mind very quickly, an ugly word that means no good. I’m hopeful that the attorneys for the Macondo Three will point out the blame game is being played here, and on this level, that’s a very dangerous play. What’s going on here is sickening. It costs a fortune to start up a major drilling operation. Every day the rig is off line costs six figures at least. The race to open up drilling is so imperative that a disaster like this was bound to occur. Rainey was under ungodly pressure to fake leak numbers. He made the absolutely wrong choices, and deserves some punishment, but he isn’t the only one. ~ by neworleansmusicman on November 21, 2012. This entry was posted on November 21, 2012 at 4:33 pm and is filed under BP, Criminal Charges, Deepwater Horizon, Gulf of Mexico, Oil Spill.You can follow any responses to this entry through the RSS 2.0 feed.You can leave a response, or trackback from your own site. Previous: Power Back On After Four Days!! Next: 38 Orleans Parish Jail Deaths Go Unanswered! !